Best Flat Stomach Exercises to Lose your tummy fat and lose Love Handles. These Exercises will shed your fat, build your abdomen and build a lean physique you always wanted. How do I lose my Love Handles? How do I get rid of my Belly fat and Love Handles? Well I have got the answer. And the following tips will work only you work them for at least 4 weeks. It takes 3-4 weeks to begin noticing the changes you are looking for like losing your belly fat, build abs and getting leaner but its worth the effort. As you have discovered in the Abdominal Exercises section that there is a 2 step formula to lose weight including stomach weight. Lose Excess fat and build muscle for a leaner muscle machine. And the exercises here follow the same formula. These exercises have nothing to do with your stomach or abdominal training and yet will help you lose weight the fastest. These are the aerobic exercises and cardio workouts that will help you lose your fat, even belly fat much faster. Visit the Weight Loss Exercises and Weight Loss Workouts section to get started. Once you lose all the unwanted and excess belly fat its time to build abs that will pop out of your mid-section. 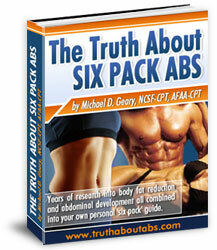 If you work harder you can even get a six pack! Visit the Abdominal Exercises section to learn more. Have a great stomach exercise or workout? 1. Any exercise for stomach if I had a c-section? There are a lot of exercises for the stomach after you have had a c-section, such as crunches, planks and oblique twists. The thing is though, you have to make sure that you are completely healed and given permission by your doctor before you begin any exercises for your stomach. 2. What are those very effective exercises for the stomach? Planks, crunches and oblique twists are highly effective exercises for your stomach. Alternate between all three and you will have a flat and tight stomach in no time at all. 3. Any exercise machines to help lose stomach fat? Any machine that helps you work on your crunches will help you lose the stomach fat. 4. How to get a flat stomach fast? Crunches are the best way to get a flat stomach. 5. How to get a flat stomach? 6. How to get a flat stomach and a big booty? The best way to get a flat stomach is to diet and exercise. Crunches are great for trimming the stomach. In order to increase the firmness and possibly the roundness of your buttocks, you will want to work on squats and reverse kicks. 7. How soon can I exercise after stomach surgery? Depending on the type of surgery you had and how fast your body is healing, you are looking at about six weeks, at least. In some cases, some people are advised to wait up to twelve weeks. It is important to consult your doctor for the exact amount of time you should be taking off from exercising. 8. How to exercise flabby stomach? Try some traditional crunches and some oblique twists. This way, you will be working out all of the muscles in your stomach. 9. How to get a flat stomach with out exercise? Diet is a major part in making sure that you are not going to have a lot of extra fat around the mid-section. With the right diet, you can have a slender stomach. 10. How to make stomach flat exercise free? The best way to control how much fat is around your mid-section is to properly diet, if you are not going to exercise. Although, a little exercise can really go a long way and it should be considered. 11. Exercise machine that will lose stomach weight? The bowflex is a great exercise machine for losing weight as you can perform a multitude of exercises with the one machine. 12. What exercise is best for tightening the stomach muscles? Oblique twists and traditional crunches are best for tightening your stomach muscles. Go from Stomach Exercises to Weight Training Homepage.